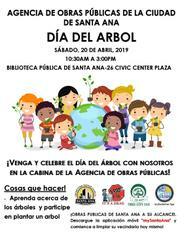 SANTA ANA, CA - Join the City of Santa Ana, Public Works Agency for their Community Beautification Day in conjunction with the Children’s Day / Book Day and Arbor Day Celebration event this Saturday, April 20, 2019 at the Santa Ana Public Library. 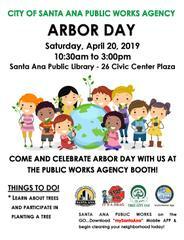 Please come to the Children’s Day / Book Day event and check in at the Public Works Booth between 10:30 a.m. and 11:00 a.m. Learn about trees and participate in planting a tree.